U of A paleontology graduate student Scott Persons says new evidence of Microrpator's hunting ability came from fossilized remains in China. "We were very fortunate that this Microraptor was found in volcanic ash and its stomach content of fish was easily identified." Prior to this, paleontologists believed microraptors which were about the size of a modern day hawk, lived in trees where they preyed exclusively on small birds and mammals about the size of squirrels. 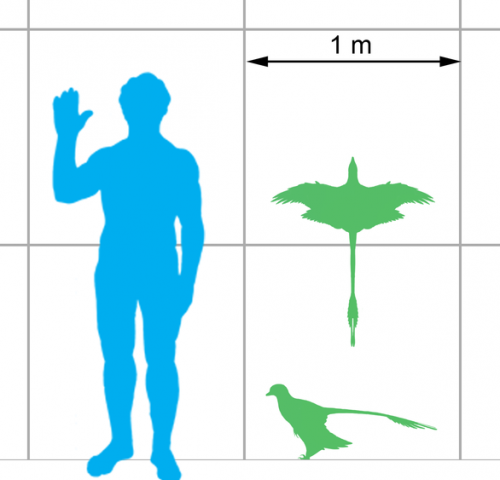 "Now we know that Microraptor operated in varied terrain and had a varied diet," said Persons. "It took advantage of a variety of prey in the wet, forested environment that was China during the early Cretaceous period, 120 million years ago." Further analysis of the fossil revealed that its teeth were adapted to catching slippery, wiggling prey like fish. Dinosaur researchers have established that most meat eaters had teeth with serrations on both sides which like a steak knife helped the predator saw through meat. "Microraptor seems adapted to impale fish on its teeth. With reduced serrations the prey wouldn't tear itself apart while it struggled," said Persons. "Microraptor could simply raise its head back, the fish would slip off the teeth and be swallowed whole, no fuss no muss." Persons likens the Microraptor's wing configuration to a bi-plane. "It had long feathers on its forearms, hind legs and tail," said Persons. "It was capable of short, controlled flights." This is the first evidence of a flying raptor, a member of the Dromaeosaur family of dinosaurs to successfully prey on fish. The research was published April 22 in the journal Evolution.